Botanically, quinoa is a seed (not a grain) and as many still don’t know it doesn’t actually need to be boiled! Quinoa is considered a superfood, because it is a “complete protein” and “gluten-free”. This recipe from my current favourite recipe book Food52 – Genius Recipes – is a watershed for anyone feeling listless about their yogurt routine. Yogurt may support a healthy digestive system. Preheat the oven to 350°F (175ºC). Pour the quinoa into a small sauté pan and place over medium heat. Toast the quinoa for about 2 minutes – it will begin popping when it’s toasted, and as soon as it does, pour it into a bowl to cool. Spread the pistachios and almonds in a small baking dish and toast in the oven for about 5 minutes, until they smell nutty and are starting to turn golden. Remove and let cool. Spread the yogurt on a small plate or shallow bowl. 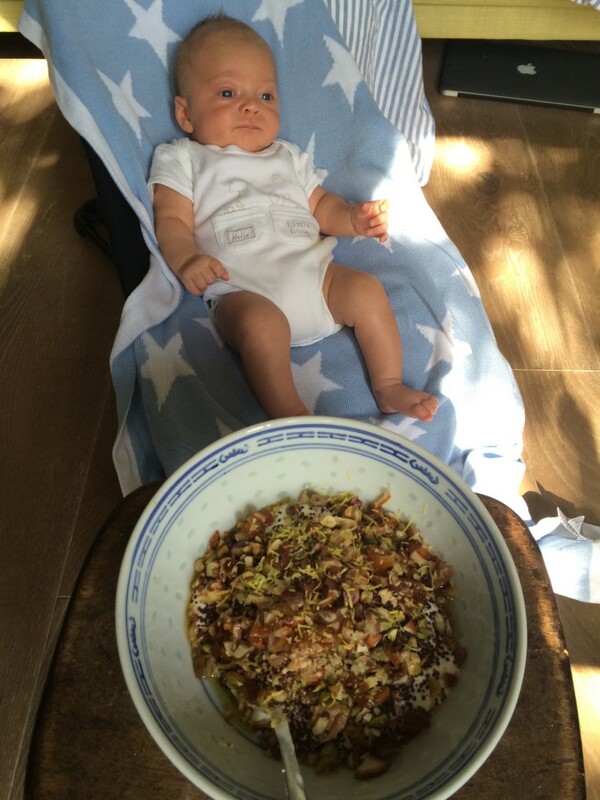 Sprinkle on the quinoa, pistachios, almonds, and dates. Fleck with lemon zest and sea salt, and finish with a sprinkling of olive oil. I have been a model for 17 years, have worked as a holistic health care practitioner and yoga instructor since 2007 and am now taking a maternity break to spend quality time with my son, born in May 2015.